How Many Wrongs Make A Mr Right? follows Melissa’s quest to find her Mr Right. It is mostly set in 2001 in both the Lake District and Edinburgh. In the Lake District, Melissa is living with her mother, her father has died and is much missed. She has had mental health issues in the past, is working two jobs but doesn’t have much money. She has a great group of friends and is hopeful that new arrival to the town, James, might just be Mr Right. A few months later she has moved to Edinburgh, has a new job and opportunities and is beginning to make new friends. There are parts of the book reliving conversations she had with her dad as he tried to give teenage Melissa guidance about boyfriends and life in general. These are quite moving as you can tell how much he loves her and knowing he has died makes the conversations very poignant. We also meet Melissa as a mum to a toddler in 2008 with I have to say, a lot of patience! Who is the Daddy her toddler talks about though, did she find her Mr Right? The book is described as chick-lit but I think it’s a bit different from your average chick-lit story. Quite often a reader can guess almost from first page who the love interest will be and that the two protagonists will end up together, although the fun of the story is, of course, how they will get there and what will happen along the way. With this book, I had no idea what was going to happen to Melissa. Yes, you know she is going to be a mother but it wasn’t obvious at all who the father was. I really enjoyed the way the book was written in first person, present tense moving back and forth between the different timescales. I felt as though I was right in Melissa’s head, listening to a stream of consciousness, and privy to all her thoughts. It was a great way to really get to understand her hopes, dreams, regrets and disappointments. I despaired of some of her actions as she tried to find her Mr Right, although so did she to be fair. She made so many mistakes along the way, so many wrongs as the title suggests. How Many Wrongs Make a Mr Right ? was a very enjoyable book to read. I particularly enjoyed seeing Melissa grow into a wiser woman throughout the story as she learns to accept that past mistakes can stay in the past while she moves on into a brighter future. Stella Hervey Birrell writes very convincingly about relationships whether between friends, family or potential partners. The book could be described as chick-lit in the sense that it focuses on the romantic aspirations of the main character, but there is a lot more depth to this book than is found in what I would usually consider chick-lit. It is a very perceptive book and one I very much enjoyed. My thanks to the author for offering me a copy of her book to review. 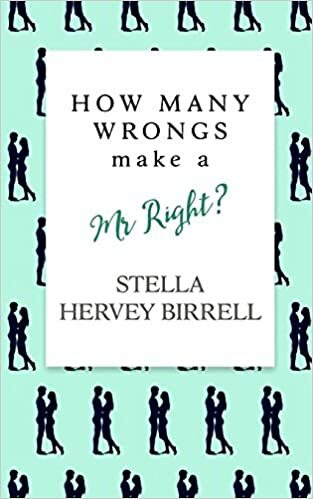 The book was published by Crooked Cat Publishing on 5th May 2016 in paperback and ebook (currently only £1.99) and you can order a copy here: How Many Wrongs Make a Mr Right? Her present: Living in Edinburgh certainly beats working two dead-end jobs, in a dead-end town, and staying with her Mum. And thank goodness for her friends: Julie – her bestie – always has her back, even if she does have a new, boyfriend-shaped growth. Gerry regularly introduces her to eligible men, so it’s OK to ignore his belief that women belong in the kitchen. And the new guy James…perhaps he could be more than just a friend? Her past: Melissa can’t stop thinking about things her dad said when he was alive. Re-playing warnings about teenage boyfriends and the over-use of the phone might not help, but it’s all she has left of him. Will obsessing about her past block the path to happy-ever-after? Her future: Stressful days with a toddler, filled with love, paint, wee (or is it just water?) and ‘I’m not eating that!’ Is every day to be a solo-parenting day for Melissa? It’s hard work searching for The One when you’re a modern, independent, strident, lonely feminist. From noisy pub to folk club, from broken heart to new start, you’ll end up rooting for Melissa, despite her despicable decisions and massive mistakes. A story about frog-kissing, bed-hopping, sliding off your lily-pad with embarrassment, and croaking with joy.